If you've visited Helsinki, you've probably spent time in its leafy Esplanade Park at the center of the city. Now Helsinki has turned the ground below the park into a subterranean lake which can keep buildings and other civic operations cool as part of a growing network that replaces traditional air conditioning systems. Like the way many cities harness geothermal heat, Helsinki's system utilizes the plentiful amounts of cold lake water which surround the city (as well as, you know, the icy Baltic Sea). 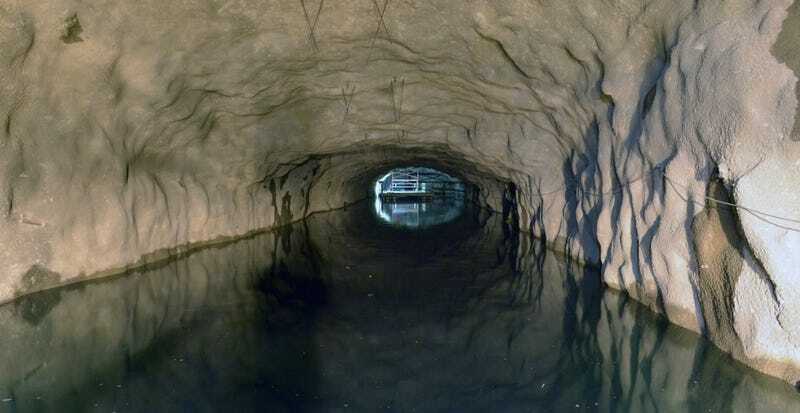 The tank, which was blasted out 100 yards below the park, is 100 yards long and can hold up to nine million gallons of cold water, which is pumped out into the city during the day to cool the city at its hottest and most active hours. The water then then returns to the tank at night to cool for the next day. Helsinki's solution is smart because it allows buildings and organizations to share resources at the city-scale: Instead of mandating renewable cooling methods building-by-building, and requiring that developers pay extra money to execute them, the city is providing the infrastructure so the network can continue to grow and expand to reach more buildings. The city says that compared to the environmental impact from conventional air conditioning systems needed to cool the same number of buildings, their centralized cooling system is emitting about 80 percent less carbon dioxide and other greenhouse gases. Based on energy demand, the city also estimates that the overall energy efficiency is about five times that of a building-specific cooling systems. While some singular buildings have similar, enclosed systems that use cisterns of water to cool various mechanical processes, these "district cooling" systems which cool large portions of cities are a bit more rare. Toronto's system, which uses water from Lake Ontario, is probably the most famous, and there are also systems in Sweden, The Netherlands, and even Cornell University in Ithaca, NY. But Helsinki's is not only extremely comprehensive, it's also part of a larger cooling and heating system. They city already claims the world's largest underground heat pump station, named Katri Vala, which uses "district heating"—absorbing thermal energy from wastewater to warm people's homes. While this exact system wouldn't work everywhere—Helsinki isn't known for being a particularly hot place for most of the year—even hotter countries can adapt their own versions of district cooling, like Qatar's well-branded Qatar Cool. Even though the water there needs to be chilled with refrigeration plants during much of the year, it's still a more efficient system then having every building in downtown Doha running its own AC. While Helsinki's model does offer a great example for many other cities that want to move away from expensive, energy-sucking conventional air conditioning systems, it also makes for a great use of space. We should have natural underground air conditioners under all of our parks.